Remove gourds from mesh bag. Scatter carefully on cloth while trying to create appearance of randomness. Light from side or above to pick up shiny highlights. Freshen up paint in palette, paying special attention to fill wells of New Gamboge, Shadow Green and Spring Green. Paint from light to dark, leaving occasional highlights and adding fresh paint in wet areas where necessary. Rinse brush and repeat with each gourd. Create shadow colour from leftover paint on palette. Mix Cerulean Blue into leftover paint of previous leftover paint on palette, and paint background. Add extra highlights with gel pen. 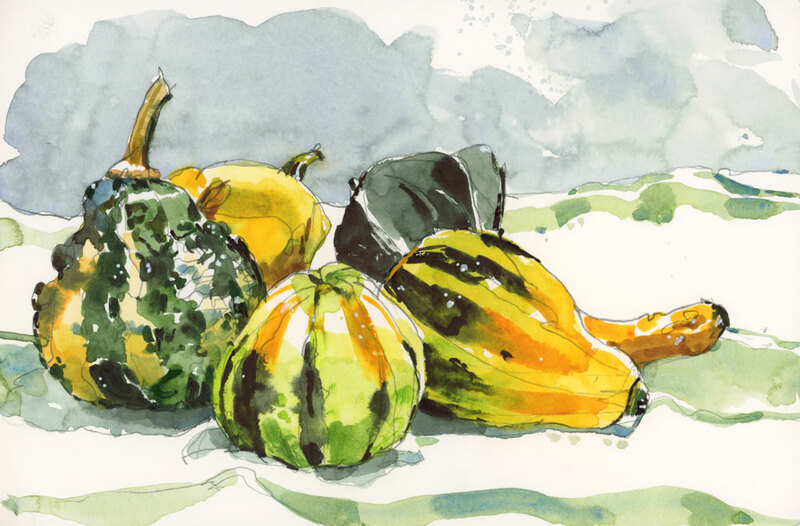 I bought a bag of fall gourds with the same idea but my painting looked nowhere near as nice as yours. They look so real and I love the glints of highlights! Thanks so much Norma. Try yours again but this time add the highlights! Thanks Vicky. Great to hear from you. You’ve described a very charming process as well as having created a specific portrait of autumn. Thanks for the recipe. This looks yummy! Another successful recipe! All the ingredients come together to make a very tasty delight. Thanks, as always, for another beautiful (and nutritious) creation. Have a great Thanksgiving. Thanks Jeff. I will have to wait quite a while to say the same to you. Always great to hear from you. Shari I am so in awe of your work ! !🤗 I especially loved today’s ” Canadian Thanksgiving ” . I guess it is partly because I am a transplanted “Alberta” girl here in the USA 🤔 Wish you gave workshops down here in Arizona !!! I love painting but nothing I do would even be allowed in a room with yours ! I have done mostly oils but just love doing a little dabbling in w/c which I is my very favorite to look at !! Keep these internet shows going ! Thanks so much Mary. I have been wanting to visit Arizona for a long time. Hope to get there one of these days. Shari – I actually sighed out loud in astonished pleasure when I saw this painting! I love all of it and am grateful to you for sharing your paint colors and process. When I stop at the Farmer’s Market on Thursday I’m definitely going to get some gourds. These rock! Many thanks Mary. Hope you got your gourds. What a delicious recipe in every way…composition, colors and instructions to try on our own! Still lives are one of my favorites and you do these as well as your scenes. Great colors. But–now you have brought up new colors I don’t have–must buy more!! Lovely painting. GREAT painting, Shari! Would you mind talking a bit about the greens you used here — where they’re from and what colors they are? They look great! These greens are all in the recipe. Shadow green and Spring green are made by Holbein, I think. And then sit back and enjoy! I love the step by step..:) And the paintings..
Glad you like it Donna. Lovely painting…thanks for sharing your recipe. Hi Linda. I use a Gelli pen. A regular white gel pen from the office supply store. Nothing fancy. Yes, try my recipe Mona! Dear Shari – just enjoyed looking through several of your lovely posts and seeing your sketches. Your post showing you painting in the car was wonderful. Inspires me to give this a go as well. Hope you have a wonderful Canadian Thanksgiving.